In the last few days, I have seen three different birds that are not commonly seen around Sitka during the winter. 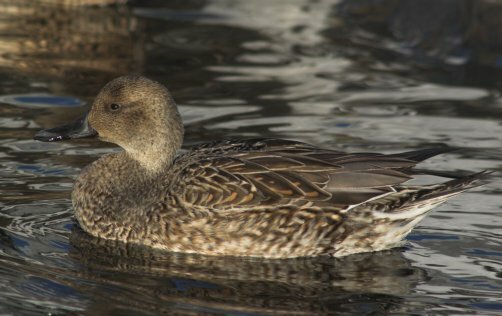 Tuesday I saw a female Northern Pintail at Swan Lake. Later in the week I saw one at Starrigavan which is probably the same one that had been at Swan Lake. Also on Tuesday I saw a gull that I thought might be a first year Glaucous Gull. It left the lake before I had a chance to get a good look at it, but when I stopped by again on Wednesday, it was there and quite cooperative. 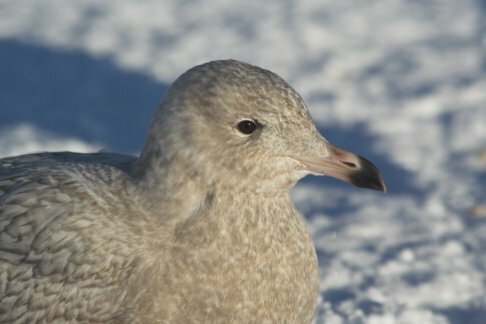 Last year there was also a first year Glaucous Gull at Swan Lake for a brief time. I have yet to see an adult, however. Yesterday at Starrigavan I saw a sandpiper fly by that seemed a little unusual. I was able to watch where it landed and find it a little later to get some photos. At the time I was not sure what it was, but after checking my bird books at home, I’m fairly confident that it is a Dunlin. They are definitely not quite as distinctive in their winter plumage. 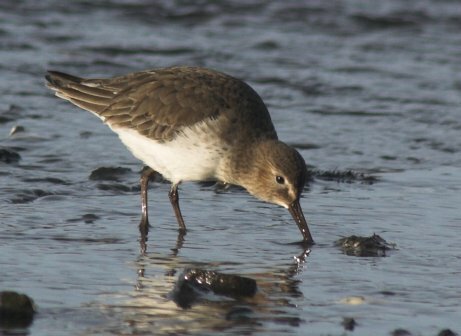 In fact, in Pete Dunne’s Essential Field Guide Companion, he comments what one of the things that distinguishes Dunlin in winter is just how plain their plumage is. 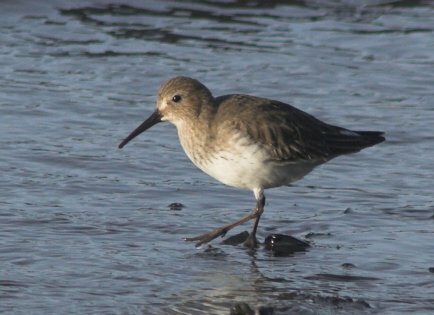 dunlins have regularly overwintered around the Gustavus Foreland in each of the last 8 winters, with up to 5000 individuals seen at a time. Good find, as they are a bit obscure, and can be written off as rock sandpipers.